For years we have saved our old clothes so we can wear them to celebrate Holi before finally discarding them. Future Group’s retail fashion discount chain Brand Factory, has launched a new campaign for Holi that aims at breaking this stereotypical habit. 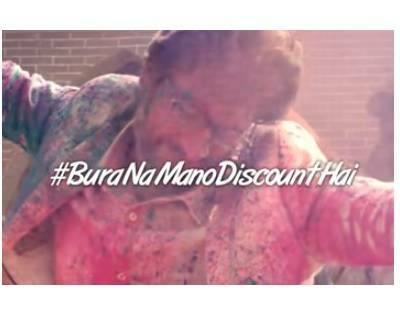 The Brand has announced huge discounts to up to 70% this Holi with their #BuraNaManoDiscountHai campaign. The campaign messaging encourages people to buy and wear new clothes on Holi by making use of the massive discounts on offer. It also borrows from movies wherein the actors are shown celebrating Holi wearing new clothes without caring about their clothes being drenched with water and colours. It is definitely an unusual campaign as it challenges the norm yet remains in touch with the essence of Holi. At the same time the campaign is a nod to the current social media trend where one wants to look their best, yet enjoy the festival at its fullest. Brand Factory will provide a spectacular chance for everyone to do so, by providing them unbelievable offers on all brands associated with them, such as, Vero Moda, Pepe Jeans, Wills Lifestyle, Wrangler, Giny & Jony, Arrow, and many more! This impressive campaign that is ‘hatke’ stays true to Brand Factory’s roots by pursuing a route that any other brand would’ve stayed away from. The digital campaign is launched via a film which showcases a prisoner who is all set to come out of the jail after years. He is gifted new clothes which he wears and turns to set out free. He then insists to stay at the prison, afraid he will spoil his new clothes because of Holi. The jailer informs him that he can avail huge discounts on clothes for 365 days by shopping from Brand Factory. The prisoner then happily leaves from the jail in the heroic manner and enjoys getting sprayed with colours. The ad is created by Publicis. The campaign is truly different as they have taken a route that all other brands have stayed away from and at the same time stayed true to the Brand’s personality and messaging.